The GR Series brings dual shredding blades for finer shredding of stalks and grassy material for faster decomposition and nutrient return to the soil. Its 4 1/2″ diameter cut capacity handles heavy mowing applications with ease, and the reinforced, domed deck is designed to minimize material buildup, allowing for faster cleaning, and providing greater strength. • Dual Shredding Blades for Finer Shredding of Stalks and Grass Materials. • Blades Create Faster Decomposition and Nutrient Return to the Soil. • Front and Rear Chain Guards Come Standard Providing Protection from Thrown Objects 4 1/2" diameter cut capacity to handle heavy mowing applications with ease. • Reinforced Domed Deck Design Minimizing Material Buildup, Allowing Faster Cleanup and Greater Strenght. • Deep Deck Design to Handle Higher Volume of Cut Material. • Reduced Blade Tip Speed to Handle Heavy Material. 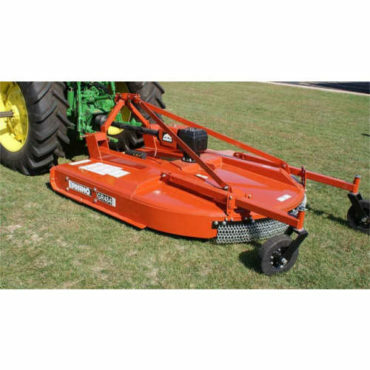 • 4 1/2" Diameter Cut Capacity to Handle Heavy Mowing Applications With Ease.